I remember noting that Saving Mr. Banks was showing in theaters in Singapore while we were there for the holidays last year. We didn't get to catch it then, and of course back in Manila it was still the all-Filipino movie period known as the Metro Manila Film Festival. So I merely noted that I'd eventually make time to watch the movie. It took me a fair amount of time before I actually remembered that little promise to watch the movie and a bit more before I actually secured a copy. I already expected this movie to be a little somber, even for a Disney-related production, but the end result was still different in other ways. This was a rather lovely look into the work that went into adapting Mary Poppins into a full movie. As much as it is considered to be quite the timeless classic now, it was a little surprising how difficult it was to get everything together in time. This is more than just a story of a woman being stubborn or anything silly like that. This is a deep tale about a woman being very protective of her creation, mainly due to feelings and history that were interwoven into the tale to begin with. 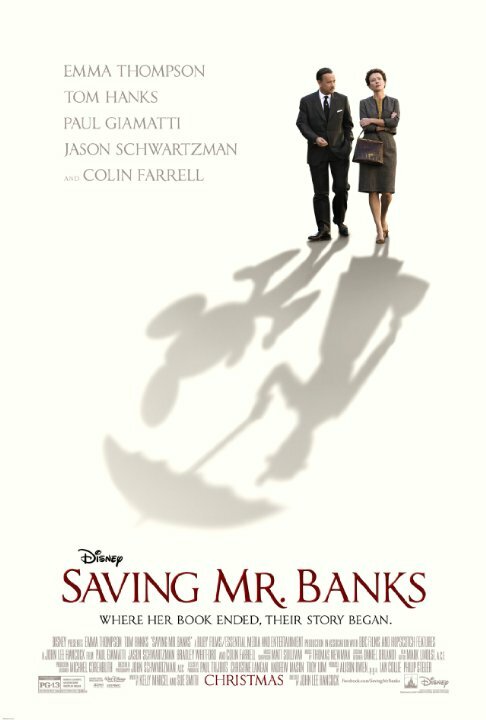 Synopsis: Saving Mr. Banks is a historical drama directed by John Lee Hancock. The screenplay had been written by Kelly Marcel and Sue Smith. The movie begins with the cash-strapped Pamela Travers (Emma Thompson) finally giving in to the requests of Walt Disney (Tom Hanks) to meet him in Los Angeles to discuss the movie rights for her Mary Poppins series of novels. And while she felt fairly certain that she'd never agree to Disney, her agent Diarmuid (Ronan Vibert) convinced her of the value of at least hearing him out. It is revealed that Disney has been trying to secure the rights for 20 years now ever since his daughter requested that the books be turned into a movie. However Pamela is entirely against animated films and thus has generally rebuffed Disney largely on principle. She eventually agrees to allowing Disney to create live-action movie based on her books, but insists to remain fully involved in the entire creative process. And thus she meets the creative team assigned to the movie, screenwriter Don DaGradi (Bradley Whitford) and composers Richard and Robert Sherman (Jason Schwartzman and B.K. Novak respectively). But the whole process proves to be quite the struggle with Pamela finding new things to object to with every session, all the while keeping the actual contract related to the movie rights in her possession as a sort of hostage. Now the whole movie has a second story woven into the narrative - that of the titular Mr. Banks, who in fact was Pamela's father. Thus we meet Travers Robert Goff (Colin Farrell), a man who a bit of an alcoholic and somewhat of a failure in life. But the one aspect where he did shine was having quite the vivid imagination, even if this resulted in a lot of inappropriate silliness at work and whatnot. And this eventually explains a lot of the reasons why Pamela came up with the story of Mary Poppins. A large part of the appeal of the movie was centered around Emma Thompson being as privileged and annoying as possible. Given the well-meaning Disney crew that tries to work with her, she rather excels at being quite frustrating and annoying with every turn. Given her general objections to animation, made-up words and other aspects of the production effort, it feels like a miracle in itself that the show actually came together. Tom Hanks made for an interesting Walt Disney, admittedly. I won't address the "accuracy" of his portrayal - I hardly feel I'm an expert on the man who pretty much "imagineered" our childhood. But if anything, he did bring a certain earnest charm to the role, which sort of matches how a lot of us imagined him to be. And yes, they tried to temper things a bit with Pamela's own concerns with working with one such as him. But overall there was a certain rosiness about his entire portrayal that was appropriate enough for the story. Paul Giamatti plays an interesting role as Pamela's driver while she's in Los Angeles, From the moment he appears on-screen you know that he's going to play a somewhat larger role than just a driver. And if anything be does seem to go on to sort of challenge a few of Pamela's assumptions and help humanize her responses to things. It was a nice little side bit to things and Giamatti certainly has the kindly quirky character role down pat. This being a Disney version of events, it's practically automatic to assume that some historical details were glossed over in favor of a more focused message for the movie. And for the most part the end result was pretty good - a warm and fuzzy little story that made for a fairly heartwarming experience. At times it feels like it runs a little long, especially with some of the flashback sequences involving Pamela's childhood. But on the whole it felt like a generally respectful effort to tell the story. Still, Saving Mr. Banks is quite the lovely feel-good movie that dips into the history of Mary Poppins but also shows how many times the creations of artists are deeply tied to their history. And the end result is a pretty good movie with some great moments for the actors involved. Thus is gets a respectable 4 revisions to the movies various songs during development out of a possible 5.